Heat the oil and fry the chips until golden and cooked. Drain on absorbent paper. Transfer to a serving dish. 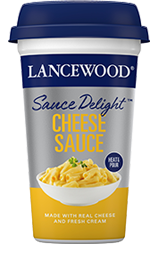 Remove the foil and place the LANCEWOOD Sauce Delight™ Cheese Sauce tub in the middle of a microwaveable plate, heat for 1 minute, stir and heat for another minute. Add the Sauce to a bowl and mix the fried bacon bits into the sauce. Spoon generously over the chips and serve at once.